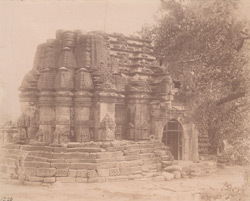 Photograph of the rear of the Mahadeva Temple at Trinetra, taken by Henry Cousens in the 1880s-90s. Trinetra is located six miles north of Than in the modern state of Gujarat. The Mahadeva temple stands in a walled compound and although it is badly worn, rich carvings on the inside and outside can still be made out. It was probably built in the 11th-12th centuries by the king Mandhata in the Satyayuga. The temple measures forty by thirty feet. The original linga that stood in the temple is now broken and it has been replaced by two others. Outside the temple stands a small tank which can be seen in the foreground of this photograph. To the east of the temple there are some memorial stones or paliyas carved in high relief. Once a year a large festival is held around the temple which attracts between thirty and forty thousand people.